Being able to interact with family and friends across long distances has been a major concern of mankind for years. Formal postal systems to communicate have been around for centuries. Many of these systems were formed in wars in which channels reached from the front line back through military units that led all the way home so loved ones could receive updates of their sons at war. However, does this mean social media was also a part of this system? When face to face communication is impossible, humans came up with plenty of creative solutions to communicate. The most notable of all of these is social media. 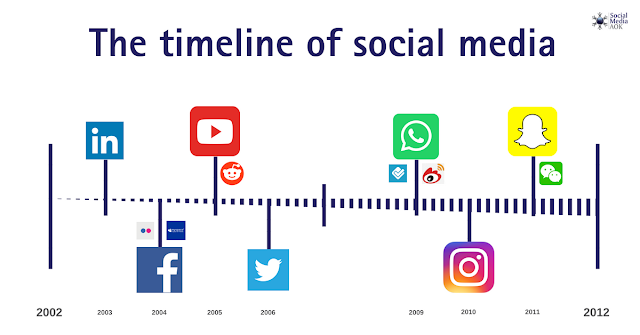 Though it seems like social media is a new trend, it stretches back to1900 and the latest social media sites like Twitter and Facebook are the outcome after many years of developments. Social media before 1900 The earliest ways of communicating across long distances used written correspondence which was delivered from one person to another by hand. The use of letters to communicate become widespread and streamlined even in the future centuries. Telegraph communications were later invented in 1972 which enabled messages to be delivered faster compared to when the message was carried by a rider on a horse. Although telegraph messages were short, they were a faster means of conveying information and news. The use of pneumatic post was then developed in 1865. Though no longer used, it was a quicker way of delivering messages between recipients. Technology rapidly changed in the 20th century with the first computer being designed in the 1940s. The engineers began to develop networks between computers which later led to the birth of the internet. The earliest internet; CompuServe and primitive forms of email were developed in the 1960s. In the 70s, network technology improved allowing users to communicate via virtual newsletters. In the 80s, home computers became more common and social media became more sophisticated. IRCs (Internet Relay Chats) started being used in 1988 and they became more popular in the 1990s. Six Degrees was the first social media site which was created in 1997. Users could create a profile and make friends with other users. In 1994, blogging became popular creating a social media sensation that is still popular. The Social media today The popularity of social media exploded with sites like LinkedIn and MySpace gaining prominence in the early 2000s. In 2005, YouTube came out creating a new way for people to share and communicate with each other across long distances. In 2006, Twitter and Facebook became available throughout the world and they have remained the most popular social networks on the internet. Other sites like Pinterest, Tumblr, Foursquare and Spotify joined in the networking niche. Today, there are so many networking sites that allow cross-posting which has helped to create an environment where users can get a maximum number of friends without losing the intimacy of private communication between two people. Social Media is also used alongside migliorvpn software so people in countries where social media is ban can still register an account. Countries such as Iran and China are well-known for blocking social media. However, such is people’s desire to reach out to others, they will go to any lengths to get onto social media even if it means risking harsh punishment by law from their domestic government should they be caught using social media networks. The future of social media can only be speculated but it will certainly exist in different forms as long as humans will be alive.